There are a lot of people on TV who are supposedly “famous for being famous.” They typically star in reality shows about their daily lives, but their daily lives wouldn’t be especially interesting if they weren’t on reality shows, making the whole thing into a weird fame circle. The internet has a similar kind of person, but they’re known as “influencers.” They’re the ones who have millions of followers on social media platforms, even though they don’t seem to do anything particularly special. These influencers are very important to the modern economy, though, because if a guy who makes funny YouTube videos tells people that he likes to drink orange juice, then other people might start drinking orange juice as well. 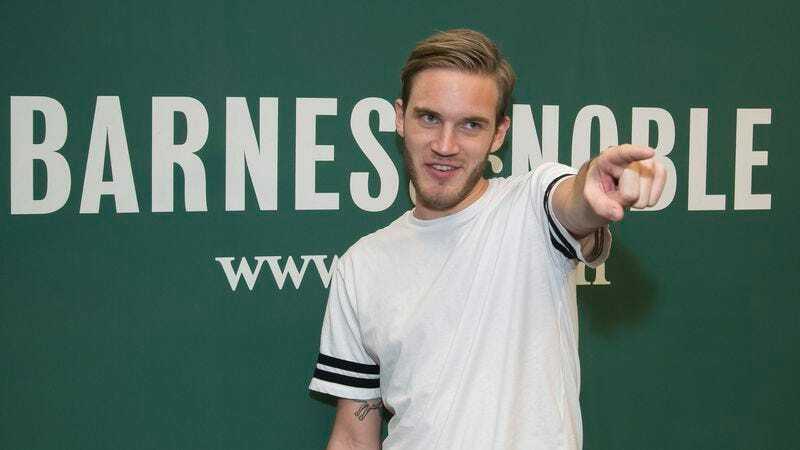 Felix “PewDiePie” Kjellberg is one of the most influential influencers in the world—just ask Time magazine—so tons of people take notice when he does something. Usually, he just does weird stuff on YouTube, but this week he got in trouble when he told his 2.2 million Twitter followers that he’s joining ISIS along with fellow internet person Seán William McLoughlin (a.k.a. “Jacksepticeye”). As reported by Yahoo News, some of PewDiePie’s fans quickly turned on him, expressing their disapproval of the joke in his Twitter replies and YouTube comments. The backlash was even so fierce and quick that Twitter banned PewDiePie’s account for a short time, possibly to protect any more impressionable youths from witnessing his sudden and confusing radicalization. And that’s how this whole thing started. PewDiePie has also uploaded a YouTube video about his dumb ISIS joke, with most of it revolving around how he thinks Twitter’s verified checkmark isn’t cool anymore because anybody can get one now—meaning he gets a lot more notifications from “verified” users than he used to. See, that’s the sort of thing that qualifies as a problem when you’re a superstar YouTuber like PewDiePie who gets paid an absurd amount of money to say hilarious things like “social media is making us all retarded” before spending several minutes complaining about how too many people like your stupid tweets. Just don’t click the “like” button too many times. You don’t want to annoy him!